That's mole as in the Mexican sauce, not the cute little character from Wind in the Willows - though something of a tautology perhaps as I gather 'mole' comes from the Spanish word for sauce. So this is Mexican chicken in sauce. I've come across a few recipes for mole before which involve cocoa powder, and I always wondered what sort of flavour that gave to the sauce but was never brave enough to try. But thanks to a combination of blog challenges this month I was inspired to give it a go! I have got a Mexican recipe book that I wanted to use, but I only hit upon this idea while at work, the day the challenge ended, so I had to find a recipe online. I also had some leftover chicken from a roast at the weekend that was on its last legs so found a recipe that combined spices, cocoa powder, tomato soup and green chillis- though for reasons you will understand later, I'm not putting the link for the recipe up. Also, I couldn't get one of the main ingredients on the way home so had to improvise.... still, isn't that how new recipes are born? Add about 1 tsp of cumin, 1 tsp of coriander, a squirt of garlic puree and 1 tbsp unsweetened cocoa powder. Then stir in some passata - the recipe said to use tomato soup but I don't like tomato soup (weird as I do eat passata) and also I had some open that needed using. You are then supposed to add one can of diced green chili peppers. This is an American recipe and as far as I know, peppers in this country don't come in a can. And just my luck, my little Tesco Metro didn't have any green peppers of any kind, chilli or bell. I decided not to buy a red bell pepper as it wasn't the same thing at all, so I threw some dried chilli flakes into the pan instead (which isn't really the same thing either, but never mind). Before adding the chicken to the pan I decided to taste the sauce... and I'm glad I did. This is no reflection on the recipe and probably a combination of the fact that I didn't have the right ingredients and personal taste, but.... it was horrible! It was the first time I have made a savoury dish with chocolate and, much in the same way that my bacon brownies were (in my boyfriend's words) a crime against chocolate, I don't think this was much better. I'd be interested to know if anyone has any good savoury recipes with chocolate that they can recommend... because based on this one, I don't think I'll be making one again. But decided that in the spirit of all things Mexican, I would make myself a margarita!This recipe I did use from my book, inventively called Mexican Recipes. First moisten the rim of a margarita glass with the rind of a lime and dip in salt. Shake off the excess. I seemed to get rather a lot of salt around the edge of my glass, I don't know if there's a trick to it! You're supposed to use crushed ice but I didn't want to go to the hassle of putting ice in a blender so I just bashed some ice cubes up a bit (and since I was the only one drinking it, that was good enough for me). Mix one shot of tequila with one shot of triple sec and one shot of lime juice - shake in a cocktail shaker and with the ice and pour into the glass. I think this might have been the first time I've had a proper margarita and it was pretty good, though there was far too much salt around the edge of the glass - I think I got too much on the rim but would probably have preferred to do without entirely. I might have to try out a few more cocktails and put them on this blog! Despite the fact that it didn't turn out very well, I am sending my Mexican mole sauce to this month's We Should Cocoa, hosted by Choclette of Chocolate Log Blog and Chele at Chocolate Teapot, as their theme this month is sugar free chocolate, which includes cocoa powder. I am also sending this to the Bloggers Around the World challenge hosted by Chris at Cooking Around the World as the theme this month is Mexican food. I'm hoping some other people can give me some recipes that turn out better than this one! that's too bad the sauce didn't work, but that 's the way cooking goes some time. :-) Chocolate goes well in chilli, so there's a savoury recipe to try! I always add a teaspoon of cocoa powder to my chilli con carne recipe to give an extra depth of flavour, I'll blog it one day. I've made mole from a Jamie Oliver recipe before and it turned out really well. It's in his American book if you have access to a copy. Shame the sauce didn't work but at least you got to enjoy a magartia for your troubles. Maybe I added too much cocoa - the recipe said a tablespoon and it was a very heaped tablespoon... I don't eat chilli con carne anyway though but I will try some more Mexican recipes. I'm actually trying to persuade my boyfriend to go on holiday to Mexico so we need to try some of the food first! i'm glad i'm not the only one who makes things that don't turn out right! it sounds horrible!!!!! with or without real moles!! Sorry this didn't turn out well for you Caroline. 1 tbsp does sound like quite a lot of cocoa, it works best as an addition which adds a certain something, rather than a main flavour. 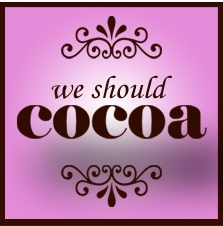 Thanks for experimenting and joining in with We Should Cocoa though - always appreciated. I didn't get your e-mail, but will add your entry now. Ah well, recipe disasters from time to time make the successes even more victorious! I've added chocolate to chilli quite frequently, but usually just go for a single large square of very dark chocolate, and it just adds earthy richness without actually tasting of chocolate. And you're not alone - I hate tinned tomato soup too, but passata is no problem! It's just so icky and sweet and weird and I can't bring myself to swallow it, with Heinz being the worst offender by a mile.